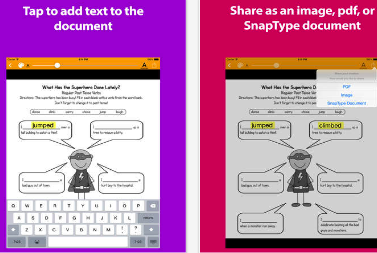 SnapType is one of the best free iPad apps for special education students. This is especially helpful for students struggling with dysgraphia, the inability to write coherently. It is also ideal for students with visual motor and visual perceptual problems. Using SnapType, students can easily work on their homework and other school assignments right on their iPad. They can simply take pictures of the worksheets they are working on or import them from other devices and use their iPad or iPhone keyboards to write on these documents. When they are done they can then print, email or share their work with others. If you have a kid having problems with handwriting, SnapType is absolutely a must try.